One of our readers sent us this graphic, grabbed from the OneCupid.com dating website. 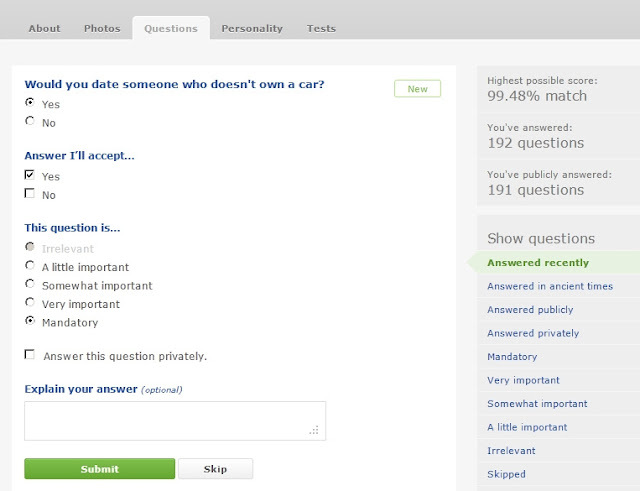 Users fill out a long line of questionaires in order to be matched with likeminded individuals. It's an American website so there are cultural references that don't really apply to the rest of the world. Questions like , "Do you believe that we should be allowed to carry weapons?". And this question, picture above. We are making inroads in our quest for liveable cities and restablishing the bicycle as transport, but there is clearly still work to be done.